What Are the Ways Someone Can Learn to Code? There are many avenues an individual can take to learn to code and get the chops needed to land a new job and change careers. Some people learn to code on their own. Self-taught individuals are highly motivated and use online resources to create their curriculum or study plans. But this path can be time-consuming, and the lack of formal training may make it difficult for these individuals to land a job. On the other end of the learning spectrum, traditional university programs that offer computer science degrees have been a time established, more formal way to move into computer programing professions. A bachelor’s degree in computer science provides a broad foundation of learning and offers easy entry into the workforce after graduation. However, college degrees are expensive and usually take four years to complete. Until recently there was not a lot of middle ground for students. Emerging somewhere in between self-learning and college degrees on the coding spectrum of learning, independent coding coot camps were born. These programs offer intensive learning experiences that prepare students with specific skills in a compressed period. Students leave boot camps ready to work and armed with the most current knowledge. These programs are excellent, but to attend a coding boot camp an individual needs to have significant resources. One of the main stumbling blocks for these independent coding schools is the commitment of time, and money required by students. Tuition for a typical boot camp ranges from $3,000 – $25,000. To attend boot camp, many students must move to the city where the school is located and be able to afford to not work during the time they are enrolled in the program. 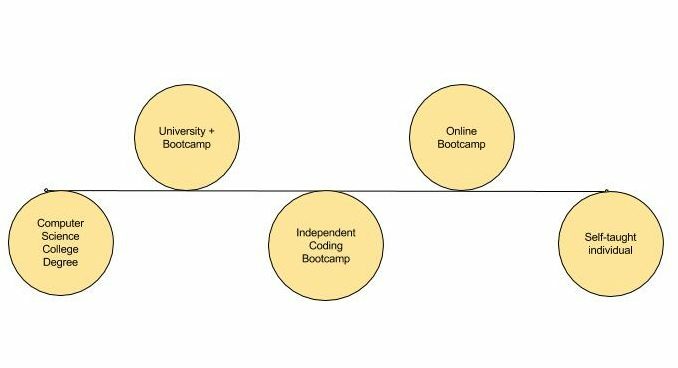 Unlike colleges, universities, or trade schools the Independent Coding Boot Camp schools have only recently begun to be regulated or accredited, making it somewhat difficult for individuals evaluate the different programs and making the programs ineligible for financial aid. The most recent trend in boot camps has been for an independent coding school to partner with an established “brick and mortar” college or university. These University + Coding Boot Camps Partnerships offer the benefits of university resources coupled with the innovation of independent coding schools. How are Coding Boot Camp Classes Offered? The modes of delivery for coding boot camps are in-person, online, or a combination of the two. Online coding boot camps allow students to enjoy the flexibility of working from home and at their own pace. Bloc, Thinkful, General Assembly are a few of the popular online coding schools. In-person boot camps require the individual attend class in-person, similar to traditional college classes. Additionally, boot camps offer part-time and full-time classes. Are Coding Boot Camps Accredited or Regulated? Each university controls the coding boot camps that have established partnerships with them. The Council on Integrity in Results Reporting (CIRR) has developed a standard framework for reporting student outcomes for independent coding boot camps. The CIRR is a new organization and consists of a group of 28 coding programs and member organizations with the goal of providing clear, simple, and validated reporting. What are the Specific Types of Coding Bootcamps? University + Coding Bootcamp Partnerships offer the benefits of university resources coupled with the innovation of independent coding schools. Some partnerships grant college credit for coursework, and some have financial aid available. University “In-House” Coding Bootcamps are programs developed by each school and are not affiliated with any outside education providers. These coding boot camps usually last 8 to 20-weeks. University + Coding Bootcamps, Continuing Education programs take place on a university campus through the continuing education department. Graduates receive a boot camp certificate of completion from the school but do not receive college credit. Trilogy Education has launched part-time boot camps in cooperation with the continuing education departments of many universities. EQUIP University + Coding Boot Camp Partnerships are initiatives between the Educational Quality through Innovation Partnerships or EQUIP, an educational organization established by the U.S. Department of Education with the goal of helping students access federal student aid for educational programs offered by non-traditional training providers. EQUIP partners with colleges and universities, including coding boot camps, online courses, and employer organizations in an attempt to access innovative learning and training opportunities that are not part of the current financial aid system for higher education. Students can get financial assistance and college credit for completing a coding boot camp from EQUIP partnerships institutions. Community College Coding Bootcamps are partnerships between community colleges and independent boot camps, similar to the university partnerships. They offer affordable alternatives to the university programs. Independent Coding Bootcamps (University Alternative) are private for-profit schools. There are more than 200 independent boot camps.Some of the most popular are Coding Dojo, Deep Dive, Dev, Epicodus, Flatiron, General Assembly, Holberton, Iron Yard, Level, Mined Mind, Revature, Sabio, Software Guild, Trilogy, Wyncode, Zip Code. How Can I Tell if Coding Boot Camp is Right for Me? Bootcamp students have vastly different experience levels and come from all walks of life. The qualities shared by successful boot camp students are a drive, willingness to work hard, love of learning, and a strong desire to enter the field. Other essential skills are the ability to pick up new technologies quickly and a capacity to work on a team collaborating with others. Here is what some boot camps have to say about the ideal candidate for a coding boot camp program and the traits or skills do they have. What are Some Free or Inexpensive Classes I can Use to See if Coding Boot Camp is Right for Me? How Much Does Boot Camp Cost and How Can I Pay for it? The average coding boot camp tuition is around $11,000.00. Although, there are a few schools that are free to students and alumni. In addition to the cost of tuition, living expenses, and lost wages for the time a student attends the boot camp need to be factored in to estimate the total cost. The expense of a boot camp is less than a college degree, but federal financial aid is available in some locations that have teamed up with universities. For example, Sabio and Antioch University have a joint program that offers two paths for students. They can take a six-month program and earn a Certificate in Web Development. Or, students can attend Sabio’s six-month coding boot camp.earn thirty-six hours of college credit toward a Bachelors of Science degree in Applied Studies from Antioch University. Students get the best of both worlds, participating in the Sabio Boot Camp and working towards a degree at Antioch University and are able to enjoy the benefits of financial aid. Most students pay for independent boot camp tuition out-of-pocket using personal savings or loans. Coding Bootcamp loans are available from third-party lenders like Pave, Affirm, LendLayer, Earnest, and Climb. Some boot camps offer payment plans, deferred payments, and have agreements to use a percent of a student’s salary after graduating to pay for tuition. Scholarships are available for minorities, women, military personnel, and other select groups. A list of coding boot camp scholarships is available from Course Report. What is the Curriculum for the Coding Boot Camp Program? Most coding boot camps teach a full-stack web development program. A full-stack encompasses the front-end, the interface a user interacts with and the design features seen on a website, and the back-end, where the foundational code allows a website to accept, process and deliver information. Depending on the coding school, the languages taught are slightly different. Most full-stack developers can code with 5 to 6 major languages or frameworks. Because programming languages can be geographically distinct, students should research the area where they want to work to make sure they are learning the most useful languages. How Should I Choose a Coding Boot Camp? Different boot camps are meant for various skill sets and these schools are classified differently than other traditional college programs. Absolute beginners should choose a program that is “Zero to” and individuals with some experience should choose a program that is described as “20 to”. The location of the boot camp is another major factor to consider. Students who can move should try to attend a boot camp in the city where they are interested in working. A benefit of an in-person program is the face-to-face networking and job placement services. It makes sense to be in the city where you want to live in after boot camp to take advantage of these program benefits. If students have an idea about what kind of work they are interested in doing after boot camp, they can narrow their search. What are the Admission Requirements for Coding Boot Camp? Almost all boot camps require an applicant to have a high school diploma. Some schools require U.S. Citizenship, and a few require a post-secondary education. Almost all coding bootcamps have applications that students can fill out online. Many bootcamps require applicants to complete pre-work to demonstrate commitment and a basic competency level. Bootcamp admission rates vary widely among schools. Some of the extremely competitive programs accept less than 6% of applicants while some are trying to get people to attend. Will Attending a Coding Boot Camp Land Me a Job? For individuals who are using Bootcamp to change careers, it is important to find a school that offers resume and cover letter assistance, interview preparation, and job placement assistance. The jobs available will depend on the intensity level of the boot camp attended and on prior experience. Forbes Magazine lists 11 Careers You Can Land After Attending A Coding Bootcamp. Other jobs include Front-End Developer, Junior Developer, and a Full Stack Developer. How Can I Personally Prepare for My Time at Boot Camp? To prepare for boot camp, students should organize their personal life so they are prepared to run on autopilot while in school. Before boot camp begins, students can streamline by paying bills early, organize finances, pre-shopping for special dietary needs and staple items, and make sure the closet is full of clean clothes. Any life activities that can be “front-loaded” should be completed before boot camp starts! A daily schedule mapping out every day for the entire length of the boot camp can optimize time management during bootcamp. Focused and dedicated students are more successful than unprepared students. What are Some Things That Can Help Me While I am in Coding Boot Camp? Hours of sitting in front of a computer can be unkind to your bum and the rest of your body! Students should take a walk every day, maybe during lunch with new boot camp buddies, to get the blood flowing and help maintain physical fitness. Daily walks will help students stay in peak physical and mental shape. Along with exercise, healthy eating during times of high stress has been shown to fend off sickness and fatigue. Packing your lunch every day and cutting out processed and unhealthy foods can give students more energy and save the time it may take to leave campus and eat. To reduce strain and fatigue in your eyes, remember to use the 20-20-20 rule daily. Every 20 minutes, take a 20-second break and focus your eyes on something at least 20 feet away. When using laptops, computers, smartphones, gaming systems and television screens take periodic breaks to give your eyes a rest. Take full advantage of the resources offered by the school. Job placement assistance, as well as help with resumes and interviewing, are valuable services. Don’t forget to network with classmates while at boot camp. Especially for students who are changing professions, friends made in boot camp may be future co-workers, employers, or employees! What Happens After Coding Boot Camp? After coding boot camp, students should be prepared to enter the workforce and be able to secure a job in the industry quickly. It is good practice for all students to maintain professional networks and participate in continuing education. Because coding boot camp programs are young, former boot camp students should consider writing reviews and advice for others who follow.